Nigerian President Muhammadu Buhari speaks during the 71st session of the United Nations General Assembly, Sept. 20, 2016, at U.N. headquarters. Nigerian President Muhammadu Buhari has said his government is not ready to negotiate with Boko Haram until it is clear who is leading the terror group. “I gave directives on three different occasions and I am not ready to go beyond this unless the leaders of Boko Haram come out in the open and say that they are leaders of Boko Haram,” he told VOA last week on the sidelines of the United Nations General Assembly in New York. "Then I will be ready to talk to them but not [to] somebody coming to tell me that they are bringing one person or two people today and that they are leaders of Boko Haram," he said, speaking in Hausa. In recent weeks, longtime leader Abubakar Shekau and former spokesman Abu Musab al-Barnawi have each stated they are leading the Islamist extremist group. 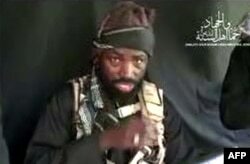 This screen grab image taken on September 25, 2016 from a video released on Youtube by Islamist group Boko Haram shows Boko Haram leader Abubakar Shekau making a statement at an undisclosed location. Buhari also said the frustration over the inability to liberate the Chibok girls needs to be put in perspective. He said that Boko Haram has killed more than 20,000 Nigerians since it began its insurgency in 2009 and the kidnapping of the 230 girls from the northeastern town of Chibok in 2014 is just one of many atrocities they have committed. He added the government will work to reunite Chibok girls with their parents and make sure that they return to school. Buhari stated that a new group targeting the oil industry in the Niger Delta, the Niger Delta Avengers, is not only causing security issues but also hindering economic and development progress in the country. 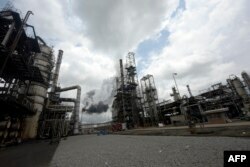 FILE - Thick black smoke billows from a pencil-thin chimney at the Port Harcourt Refining Company Limited, Rivers State on Sept. 16, 2015. However, Buhari said this is not going to prevent the government from addressing Nigeria's electricity and power shortfalls. The government is planning to construct more dams in the northeastern area known as the Mambila Plateau to provide hydropower as well as add dams in other locations, he said. “We are working toward this tirelessly," he said. Buhari added that his government will negotiate with the Avengers if they are open to it, but cautioned that he is fully prepared to continue the military campaign to its conclusion. “If they are not ready for compromise, so be it. We are ready for them,” he said. Buhari acknowledged the longstanding, ongoing problem of corruption of Nigeria, but said he cannot deal with it in the same manner as in 1983 when he came to power through a coup. During that time, commonly known as the “war against indiscipline,” his government was able to arrest and swiftly imprison those suspected of corruption. Now, he said, things are different. Buhari came back to power when he defeated incumbent president Goodluck Jonathan in the 2015 election.